A detailed description of the ins and outs of collecting medieval coins, a field of coin collecting different from any other. Includes hundreds of color photographs of medieval coins (along with descriptions of each coin). 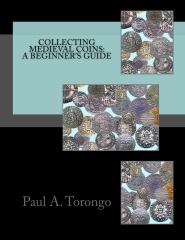 Covering topics such as medieval minting practices, medieval mint errors, reading medieval coin legends and everything else the reader may wish to know about medieval coins and collecting them.